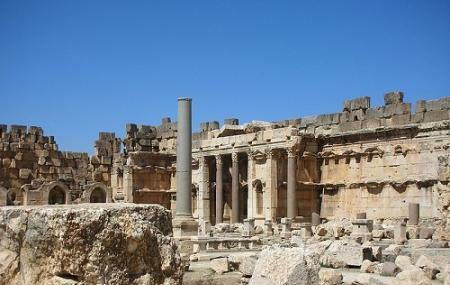 Baalbek was previously known as Heliopolis and has some of the best remains of the Roman Empire from centuries ago. Some archaeologists even claim that the temples here are much vaster than the ones found in Rome itself. A lovely little secret hidden in the little town on Baalbek of Lebanon, this attraction is a must visit for people who love to dig deep into the unconventional sources of history. The ruins here have really stood the test of time with earthquakes and wars surrounding it. But the olden temples and construction sites still stand with their head held high and are one of the most unconventional tourist spots of Lebanon. Create a flawless plan, make use of Baalbek trip planner. Oomph up your visit by adding the best hotels in Baalbek like Palmyra Hotel and Kanaan Group. If you want to add the visit to Baalbek Roman Ruins in your trip, you can choose from the variety of Baalbek vacation packages that can be designed to suit your preferences. These packages also cover your major concern of how to reach Baalbek. Love this? Explore the entire list of places to visit in Baalbek before you plan your trip. Fancy a good night's sleep after a tiring day? Check out where to stay in Baalbek and book an accommodation of your choice. How popular is Baalbek Roman Ruins? People normally club together Chabrouh Dam Lake and Temple Of Bacchus while planning their visit to Baalbek Roman Ruins. Majestic by any standard! Make sure to visit in April or September to enjoy the outdoor experience in nice and pleasant weather. You feel as though you are stepping into a time capsule to the times of Roman antiquity. There are your guides available who speak English, French, and Arabic. You can also tour by yourself and explore the ruins. The Temple of Jupiter is simply overwhelming in the expertise of its construction and how well preserved it has been over the centuries. Don’t think, just get here and be amazed at the exquisite, the vast, the incredible, the stunning and absolutely mind blowing sight which is Baalbek! Words can’t even come close to describing the wonder of this place. Try to go here without a timeframe so you can spend all day exploring the entire masterpiece! Absolutely spectacular. I highly recommend you hire one of the local guides from the entrance. He or she will impart so much interesting knowledge that one never would get on one's own. I was blown away by the history of this place dating back to the Phoenicians. Wonderful and amazing place. The dimension of the stones used to set up the temples basement goes far beyond hundreds of tons each. The details of the carvings and the highs of the columns makes this place one off the best roman ruins sites in the wolrd.